Zombies hate clowns. They also hate hippies, not to mention ziplines, penguins, moon penguins, nudists, weddings, sharing, and kittens. They really hate unicorns, strangely don't mind Canadians, and love YOU. 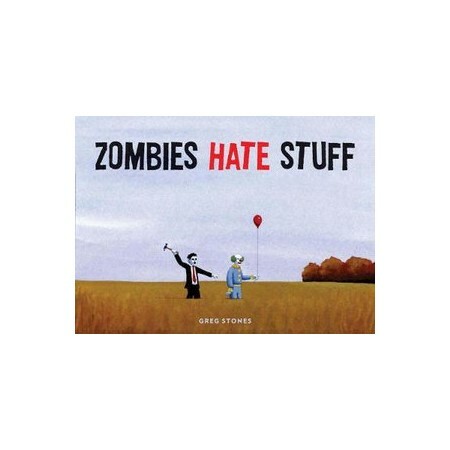 Greg Stones's colourful gouache paintings set funny and unexpected scenes of zombie disgruntlement, offering a fresh and irresistible perspective on the zombie apocalypse and a pop culture phenomenon that just won't die, cataloging the stuff that really riles up the walking dead (astronauts, rain, bagpipes, re-gifting . . . ) with wit, humour, and, of course, brains. Greg Stones is an artist and author who lives in Greenville, Rhode Island, U.S.A.